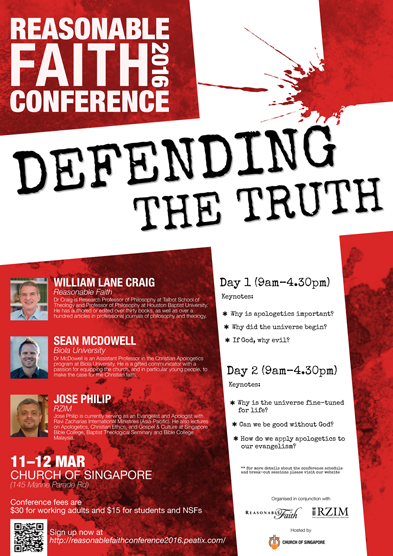 Date/Time - 11 – 12 Mar (Friday & Saturday), 9 a.m. – 4.30 p.m.
Join the Reasonable Faith Conference to listen to a panel of speakers who will equip and encourage you to use apologetics and defend the truth of Christianity with reason, logic, and evidence. Dr William Lane Craig, Dr Sean McDowell and Mr Jose Philip will speak on topics such as the problem of evil, whether Christianity is in conflict with science, and if there is evidence for the existence of God, and more. Organised by Ravi Zecharias International Ministries and Reasonable Faith Singapore. Fee: $15 each for students and NSFs; $30 each for working adults.